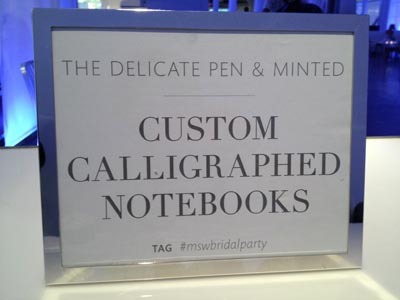 One of our great pleasures, here at The Delicate Pen, is seeing photos of our calligraphy and stationery items in action at a wedding. Even more pleasurable is catching glimpses of the event with all coordinating elements in full swing, but inevitably, most beguiling are photos of the bride and groom. 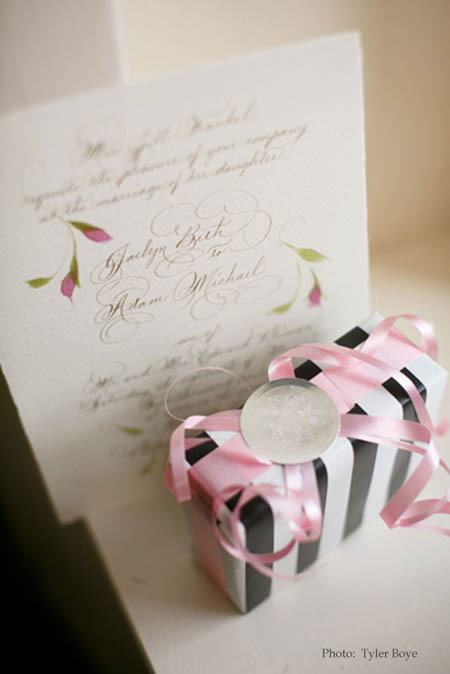 The wedding we are posting today is especially delightful, because it is one of two weddings for which we created separate invitations. For two sisters! The weddings were about a year apart, one last August and one just a few days ago. 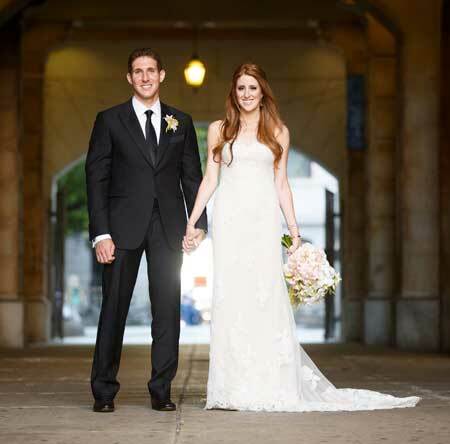 The first wedding, of Jacklyn and Adam, held at the Arts Ballroom in Philadelphia last August, is our feature today. You’ll have to check back for the second sister’s wedding! An imported Italian paper with deckled edges and soft gold ink, accented with hand painted mauve flowers, was chosen for the invitation. 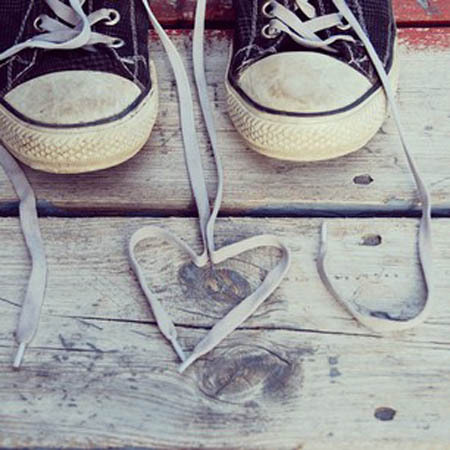 We like to add a touch of romance to every thing that comes out of the studio. The colors and textures chosen made that mission an effortless one. Jackyln and Adam. Gorgeous and glowing. A stolen kiss. The newlyweds – unaware of the inevitable smiles of passersby. All photos: Tyler Boye Photography. I was asked to participate in an event for Black Grouse Scotch. It was quite an evening! As each guest arrived, they told the uber talented bartenders what flavors they preferred in their cocktail, using Black Grouse as a main ingredient. A personal cocktail was then concocted for them on the spot. I had two assistants positioned near the bartenders. They made notes for each individual’s recipe. 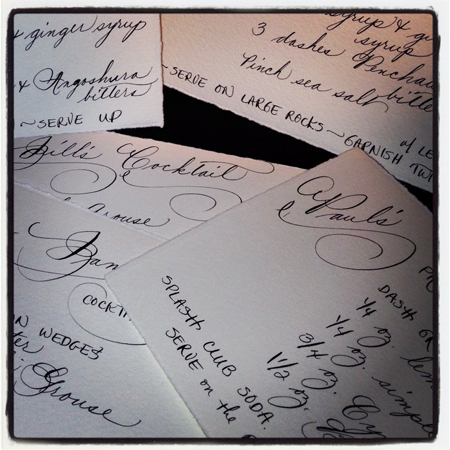 The notes were then shuttled over to me at the calligraphy table where I lettered all evening. 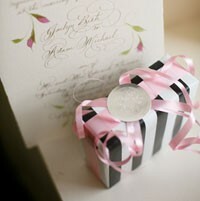 Each guest was then presented with a hand lettered recipe card as a take away gift! The idea is a great party idea don’t you think? 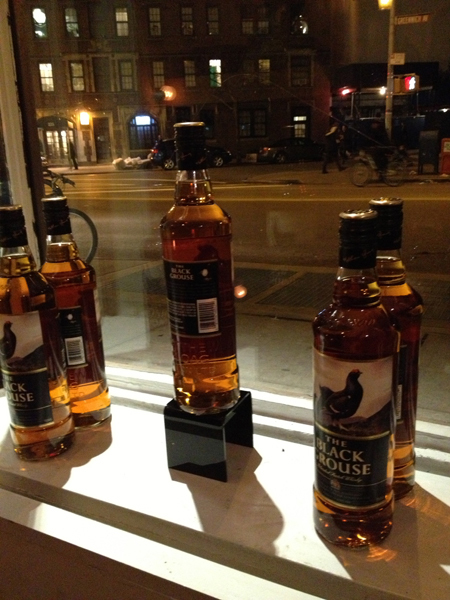 Bottles of Black Grouse set against a New York City street. I was quite busy penning all the details of each individual recipe! 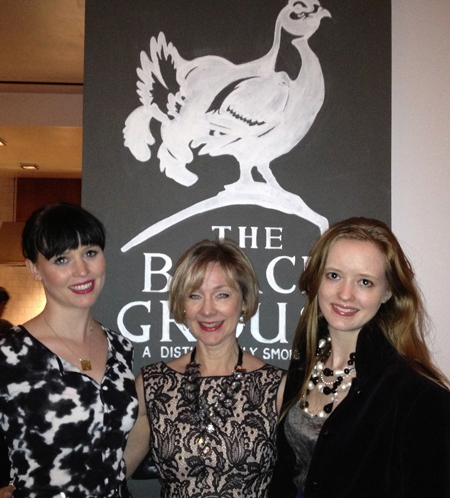 The Delicate Pen team for the evening posing in front of the Black Grouse chalk drawing that was drafted on the wall for the event. A reminder from The Delicate Pen to drink responsively and never drink and drive. 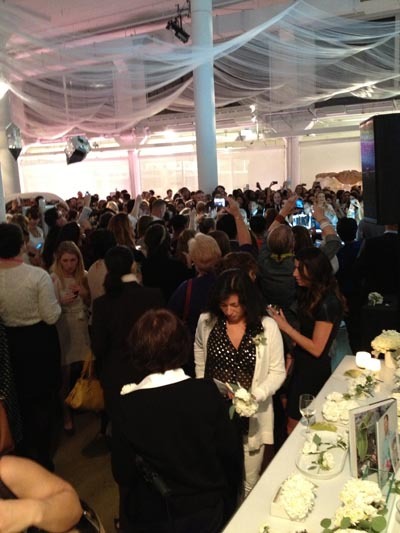 The video and blog post over at the Martha Stewart Weddings Blog is up! You can view it here. Thank you Erin Furey for such a nice write up! 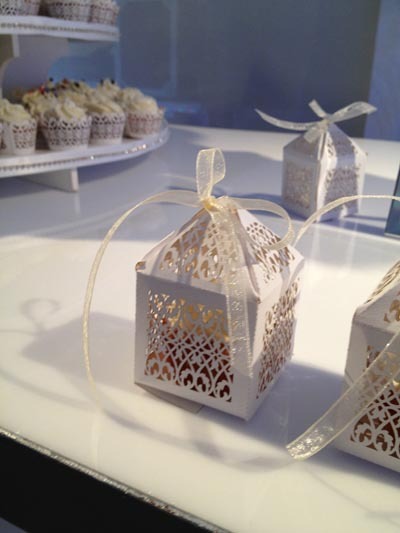 Here are a couple sneak peeks, but don’t miss the video over at their blog! Plus it is a great blog to know about in general! Hi! After a very long stretch of being away, the blog is back! We debuted our new album of designs at the National Stationery Show in May and it has taken all these months away from the blog to produce those albums and keep up with spring and summer wedding orders. As a friend of mine says, “We can only be super women 90% of the time! We had no idea we would be such a hit at NSS and so it took quite a while to produce the albums since every sample is hand painted. But the books shipped out all across the country last week and now there should be a little snippet of time again to post blogs regularly. Our first post back is a fun one too! 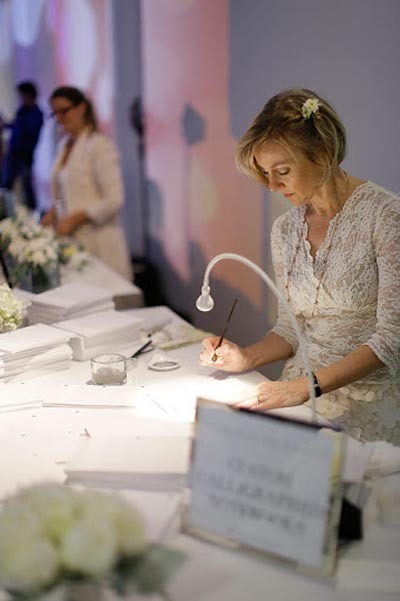 I was honored to be the calligrapher at the grand party held at Martha Stewart Weddings Headquarters during Bridal Market week. The highlight of the evening was a real wedding that took place, officiated by Martha herself! You MUST read about it here. 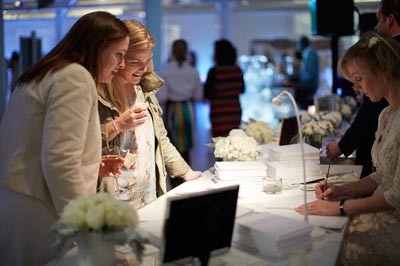 My part in the evening was to personalize notebooks made by Minted, with each guest’s name during the event. 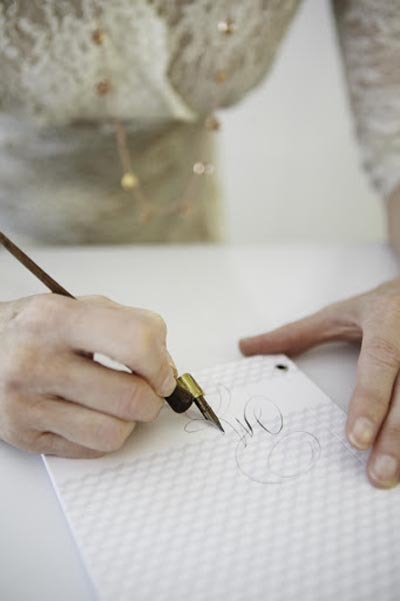 There will be feature and a little video on the calligraphy I did on the notebooks on the Martha Stewart Weddings Blog soon, so you will just have to wait patiently for those images! (I will alert you on when that appears on that blog.) Here are some features of the evening, however. 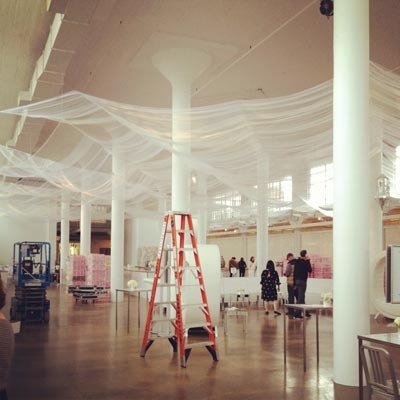 I love setting up for an event. A little production that has to come together at just the right time gives me a little adrenaline rush every time! At just the right moment the room was ready. Everyone cleared the room for a photo op! 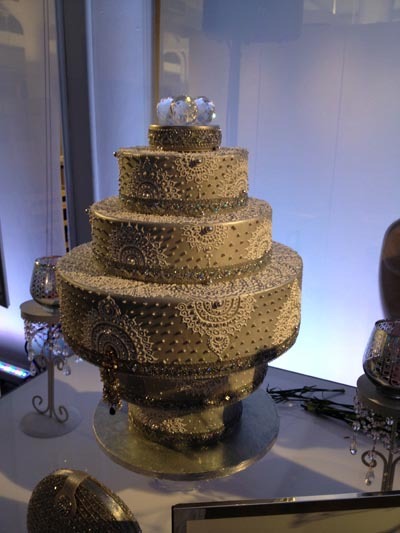 Creme Delicious provided henna style decorated cakes and cookies. Trays and trays of yummy food, ice sculptures and then more cupcakes and party favors by Jaret’s Stuffed Cupcakes magically appeared all evening. A calligrapher friend, the very generous Bernard Maisner, honored me by letting me letter a notebook for him. The party in full swing! Hi! I am so sorry to have evaporated for over a month! We took a little unexpected Company Vacation when the opportunity arose. When we returned, we were blessed with a profusion of orders and we are just catching up from that whirlwind. The hiatus has perhaps just made you long even more for the photos I promised of Jocelyn and Ryan’s wedding. So, albeit a little delayed, here they are and well worth the wait! 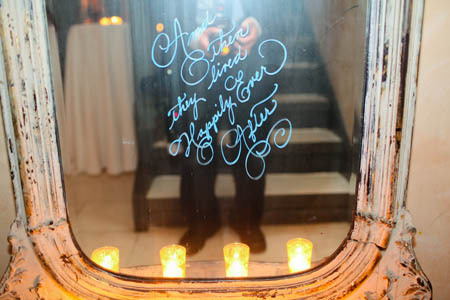 While I was lettering the mirrors for their wedding, the bride and groom arrived at the venue. 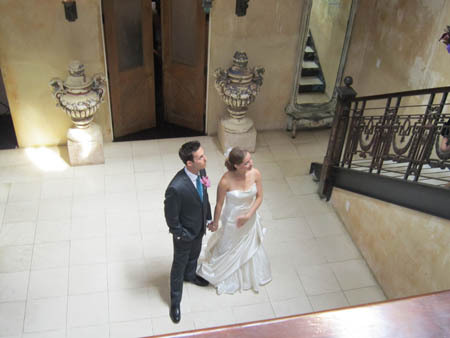 I often don’t get to see the soon-to-be-married couple, so to spy them just before the event was a terrific perk for me. I managed to get a few photos from the ladder where I was poised with my pens! 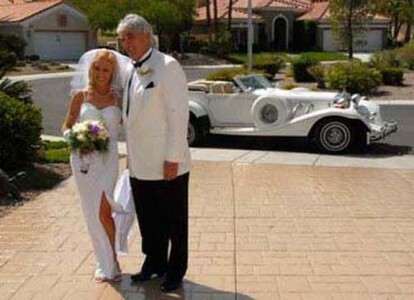 No photo compares, however, to this wonderful, professional photo of the bride and groom. What a moment! 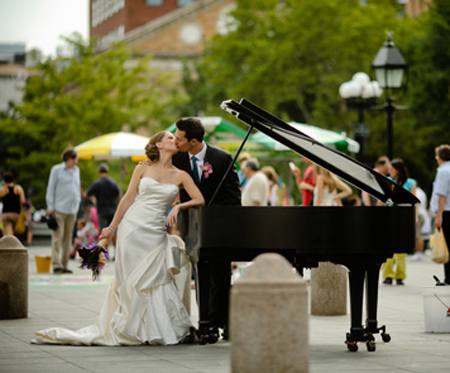 How fortuitous that this wedding took place during the Pop Up Piano event to create such a fabulous setting for a memory on film! 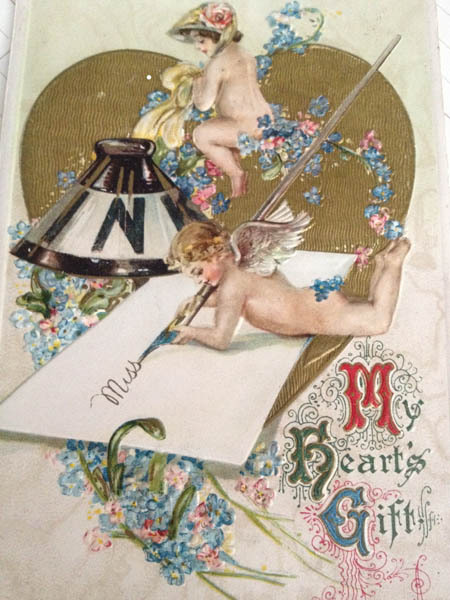 Happy Valentine’s Day from The Delicate Pen! Here are a few images to get you in the spirit! Some wonderfully creative lettering. The image is from my acquaintance on Instagram. @nrichardsen from Norway. 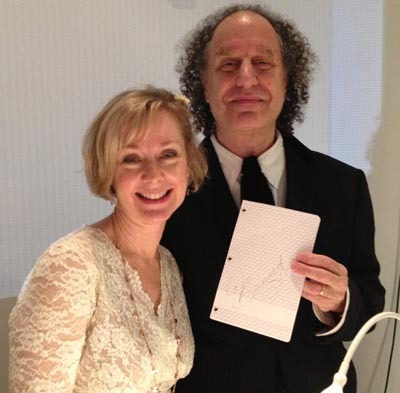 @delicatepen thanks you, Nina, for permission to post the photo! I have been waiting since June to share this photo on a romantic occasion. 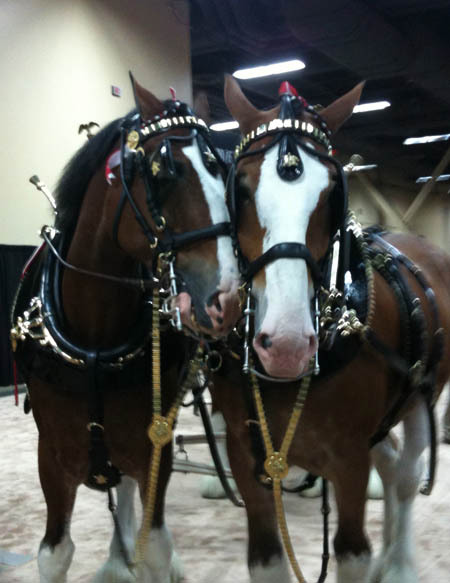 While at the LIMA show last June, the Anheuser Busch stately horses clip-clopped in the Mandalay Bay convention center one day, bringing the trade show floor to a magnificent halt. These two are obviously sweethearts. 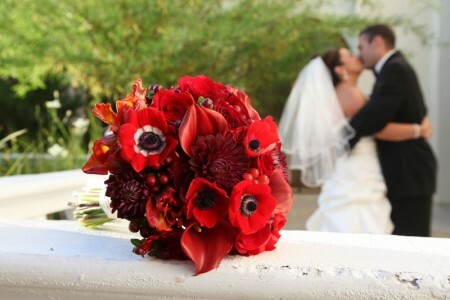 Every so often one of our brides indulges me, by giving me permission to post photos of their wedding. Such is the case with Jocelyn and Ryan. 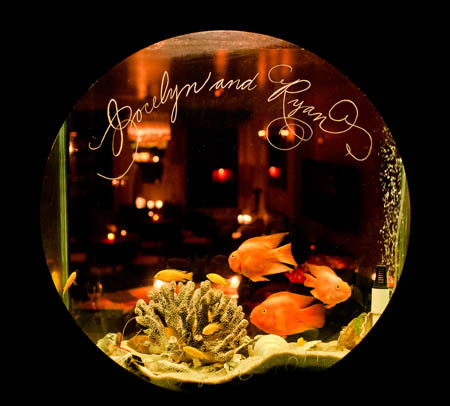 This lovely couple contacted me about calligraphing the many mirrors at their wedding venue, 632 Hudson in New York City. I met Jocelyn at the venue weeks ahead of the big day to scope out the lay of the land, measure the mirrors and access how much time I would need to letter them on Wedding Day. 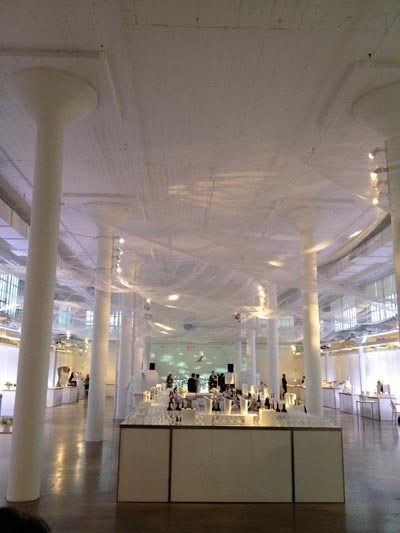 I was enchanted by the venue and its many nooks and crannies, and thus, my creative juices starting flowing about where and how to enhance this intimate event with the flourishes of my pens. They gave me full artistic license within the guideline of using a palette of white for much of the lettering, with accents of the vibrant colors of peacock feathers, which were a recurring theme of the wedding. At first glance, I realized this fish tank was the perfect opportunity for some circular lettering! 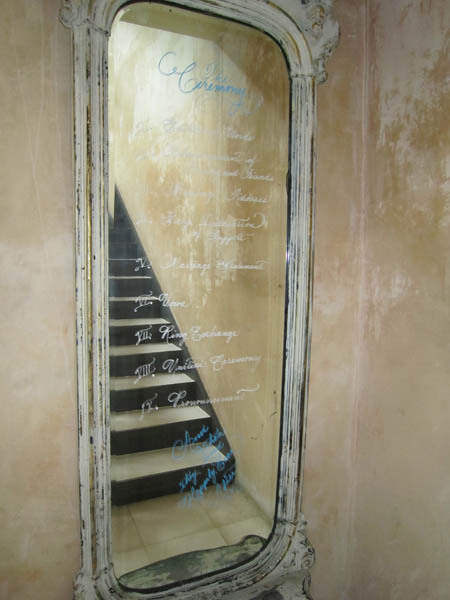 The ceremony’s program was lettered on the mirror at the base of a grand staircase. 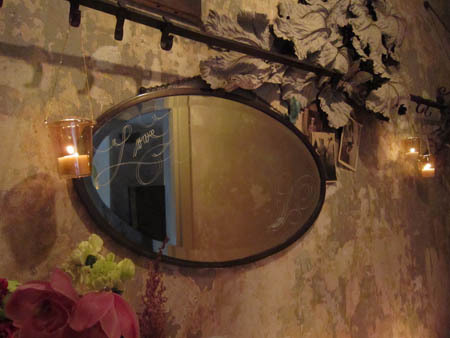 Here is a close up of the base of the mirror where I saw the possibility for a little romantic accent! 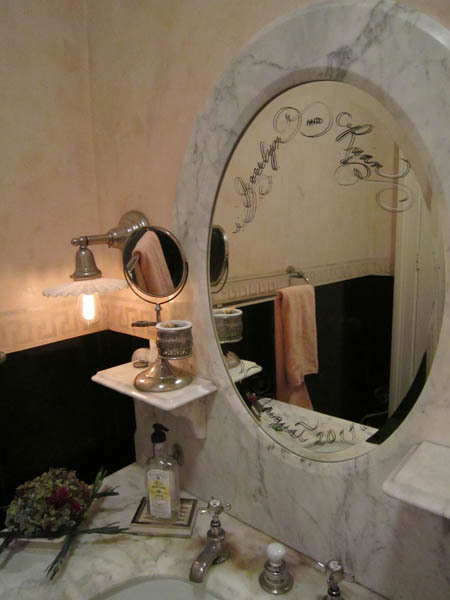 One of two powder room mirrors which received adornments. 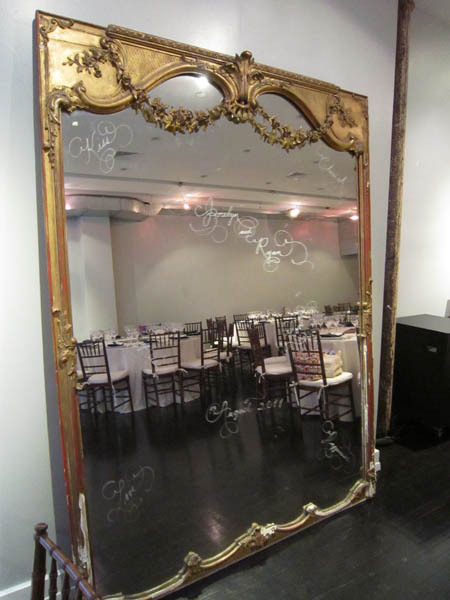 The large mirror in the dining area was great fun to letter, with so much space. I lettered it sparingly, however, so that the reflection of the evening’s events were the main focus. This is just a teaser for our next post in a few days where you will see the glorious bride and the dashing groom! Photos: First and Third Photos © Yun Gen Yang Photography. All other photos © Jane Labanz. I thought before I present our first Delicate Pen Wedding in this new year, I should review some wedding highlights from 2011! 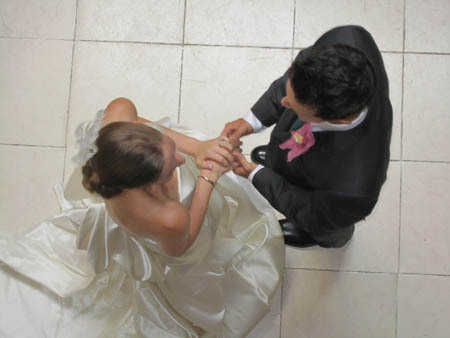 Best Wishes to all our 2011 Delicate Pen couples! Everyone needs a friend like my friend Barbara! When I went this week to purchase a sheet of Owney the Postal dog stamps that were released in July, 2011 for my stamp collection, of course, not one was to be had in all of NYC. So, whom do I call for these kinds of dilemmas? Barbara! Barbara lives in DC and works near the National Postal Museum, which has a gift store with difficult to find stamps. Yesterday, my coveted stamps sheets arrived in the mail, thanks to my loyal friend, who knew this little acquisition meant more to me than any “normal” person. 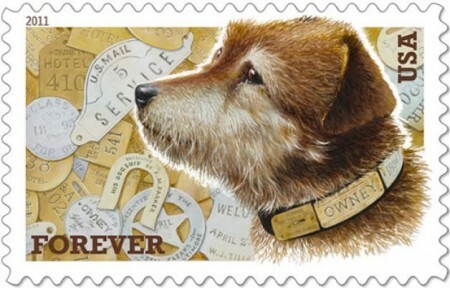 Owney was a tatty little Irish terrier mix that became a mascot of the Albany, New York post office in 1888, when he was discovered curled up on a pile of old mail bags one day. Owney began accompanying the mail bags onto horse drawn wagons and then subsequently onto the Railway Post Office train cars all over the state and country. He even made an around the world trip in 1895. The mail clerks considered Owney was a good luck charm, for even though train wrecks were a common occurrence back then, no train that Owney rode on, was ever in such an incident. Owney marked his travels with medals and tags on his collar. When a certain Postmaster General John Wanamaker learned that the collar was becoming too heavy for the mutt, he created a harness to display his tokens. The circumstances of Owney’s death are unclear and not documented accurately, but Owney had become old, nearly blind and a little ornery. He died of a gun shot wound on June 11, 1897. His remains were preserved and they are on display at the Smithsonian Institution’s National Postal Museum, the very museum where my commemorative stamps were purchased, and where one of my decorative envelopes was awarded a prize in 1999 and was on display under Owney’s watchful eyes that year. Owney wears his harness and is surrounded by his tags in the museum. Countless books, movies and stories have been written about Owney. Owney even has his own multi dimensional app! We are happy to announce that we were asked to letter some fun table numbers for a wonderful feature in Martha Stewart Weddings winter issue on stands now. 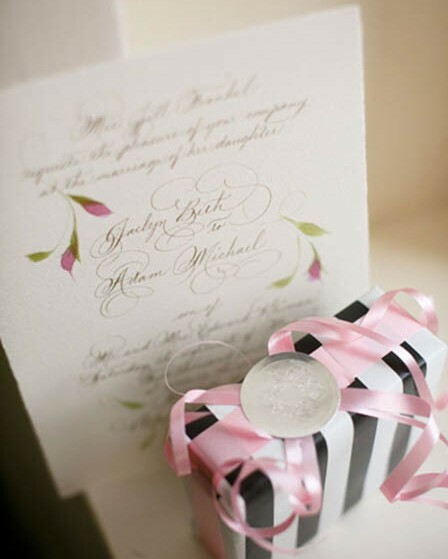 The article suggests using a wedding palette of black, white and gold. The table setting is just gorgeous, don’t you think? Click here to see more images. 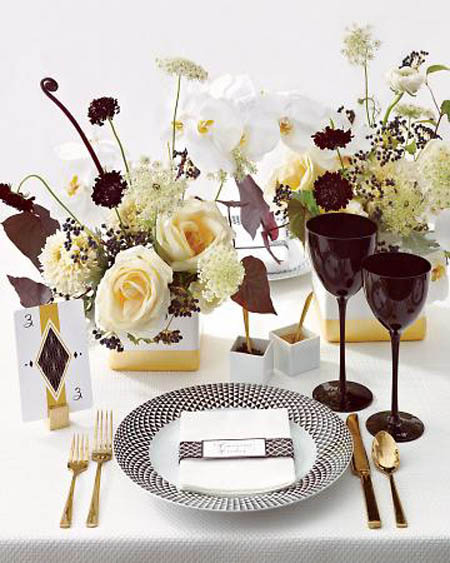 Black, white and gold table setting with a table number lettered by The Delicate Pen. The artwork and content on this site is protected by registered copyright. Please exercise proper legal etiquette by attaining written permission before using content. Copyright ® 2011101010. All Rights Reserved.